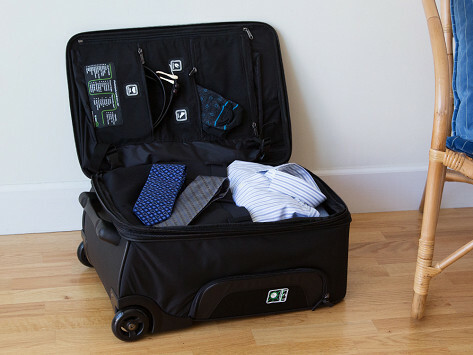 The Genius Pack 22" Carry On is an innovative carry on bag. With its Laundry Compression pouch, engineered organizational panel, genius functionalities, and permanent checklist, nothing gets left behind. Dimensions: 22" x 14" x 9.5"
Fantastic product! This bag is everything that it says in more. If you like organization this bag is for you. It is a great bag, but I wish it had straps across the main body of the bag. I bought for my husband, who is not a fan. His issues: 1) the weight on the lid (when filled as designed) makes the bag unstable standing on 4 wheels. 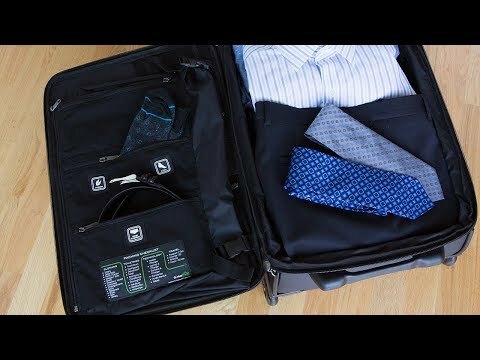 It tips forward, which means you cannot rest your briefcase/laptop bag on it while walking through the airport 2) It is just a bit too narrow to hold a suit jacket. And the Carry On is also a convenient, must-have companion. Need to charge your phone? There's a battery pack stored in your carry on. Want to keep dirty clothes away from clean? There’s a separate compartment for them, with a Laundry Compression feature that presses all the air out, leaving you more room. An integrated toiletry bag, umbrella, water bottle storage, and even a last minute checklist are all included, too.